For Muslim communities abroad, the question of which language to use in the mosque can be a tricky issue. For Muslims in Italy, many of whom have come from other countries in recent years, face the challenge of maintaining their own language while simultaneously trying to integrate into Italian life. Their choice of language has a significant affect on the Muslim community and interfaith relations in the host country. 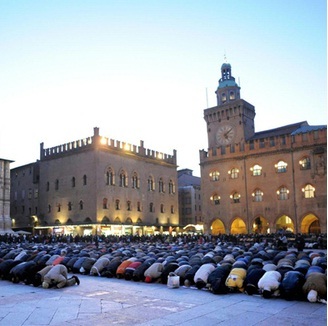 There are several substantial Muslim communities in Bologna, my adopted city. The largest immigrant groups come from Albania, South Asia (mostly from Bangladesh), and from Middle Eastern countries such as Algeria, Tunisia, and Morocco. Muslims make up approximately 1.4% of the city’s population, a figure which mirrors the national percentage. Although there are over a million Muslims and 500 mosques in the country, Islam isn't actually a recognized religion in Italy, despite it being the second largest religion after Catholicism. It's rare to find a purpose-built mosque in Bologna mainly because the mere suggestion tends to cause a rumpus with the anti-immigration Northern League party. As a result, previous plans to build a large mosque in Bologna never came to fruition and therefore Bolognese mosques tend to be fairly small and inconspicuous. They are usually re-purposed buildings which have been adapted to suit the needs of the Muslim congregation. Mosques will often use two languages during Jummah prayer (the Friday prayers which are obligatory for men and optional for women). Arab majority mosques usually use Arabic and Italian whereas Bangladeshi majority mosques tend to use Urdu and Arabic. However, each combination is problematic because it leaves out a key demographic. The Arab mosques have it quite easy really. They use Arabic, the mother tongue of the majority and the language of the Qur'an, and then the language of the host country, Italian. It does however mean that only those from Arabic speaking countries are likely to attend. The Albanian and Bangladeshi majority mosques have a more complicated decision to make. Clearly, conducting prayers in three languages is impractical and far too much of a hassle. Therefore these mosques usually retain Arabic because it's the language of the Qur'an and then go for the common denominator either Urdu or Albanian and leave out Italian. Excluding Italian however can cause several problems of its own. The first is that any new Italian Muslim has absolutely no idea what's going on. Converting to a new religion already feels like learning a new language without adding further communication barriers. It's incredibly daunting to go into a mosque when you can't understand a word! Converts can often be picked out from the crowd by the glazed look in their eyes as they try in vain to pick out recognizable words like Allah (God) or Jannah (heaven) from what the Imam is saying. Not being able to understand the language being spoken discourages new converts from going to the mosque. They are forced to turn to ‘Sheikh Google’ for guidance and find support through Muslim friends online. The second reason why using Italian is important is that many second or third generation Muslim immigrants understand Italian better than they understand Arabic or Urdu. They may also feel that Italian is more relevant to their current life in Italy. On the other hand of course, having the sermon in Italian would mean that the elderly in the community might feel excluded. Many elderly immigrants haven’t learned Italian and some don’t understand Arabic either. I've had many bizarre conversations with elderly women speaking in Urdu or Albanian while their younger relatives translate into Italian for me. Then again, many argue that as it’s usually the case that each community pays for their own mosque, it should be up to them which language they conduct their services in. After all, the Imam should attend to the needs of the people in his congregation rather than using Italian merely to get bums on carpets so to speak. The main advantages of having sermons and prayers in Italian alongside Arabic however would be twofold: Non-Arab Muslims, converts, and non-Muslim visitors could go into any Italian mosque and understand what's being said and there wouldn't be such a sense of each community being isolated from one another. Muslims in Italy would be united as an Ummah through the use of Arabic for Salah prayer and recitation of the Qur’an but also united as Italian residents and citizens by using Italian. This move has the potential to facilitate much needed Interfaith Dialogue in Italy. Rather than viewing Islam as a religion wrapped in a foreign language, Italians and Muslims would be able to communicate using the same language and terminology to describe God and faith. Using the host country’s language would not only encourage integration and social mingling between different ethnic groups of Muslims but also between Italians and Muslims at large. Does language ever cause problems in your place of worship? What languages are used in your mosque / church / place of worship? In Bozen-Bolzano (Italy), I've been to two different mosques. One is Pakistani, and the other one is Arab. The Pakistani mosque uses Urdu only, while the Arab one uses Arabic, and then translated into Italian. To me, there is no difference because I don't speak Urdu, Arabic, nor Italian :) But I understand why they don't use English, so no hard feelings. It's interesting that you've had similar experiences in the North - thank you so much for sharing. Most mosques in Nigeria use a local language alongside Arabic and as dictated by the audience e.g in an academic environment English takes the place of the local language. Though some mosques use only Arabic what's sure is most of the congregation struggle to follow the Imam in such mosques. As u rightly point in ur article get as many people as possible to follow what Imam as got to say should be a priority. Thanks for that interesting info about Nigeria. I recognize the need to use some Arabic - in daily prayers etc - but you're right - it's about balance and people being able to understand what's going on. Don't mind my typos! Hope u got the point.